Dreamy Weather is an enchanted and intimate recording, captured at the historic Cactus Cafe in Austin, Texas. This collection features brand new material mingled with songs from earlier albums, played as never before, with RyDog Johnson's crystalline electric guitar and bewitching vocal performances by Erin Ivey and special guest BettySoo. A tour de force -Earache! 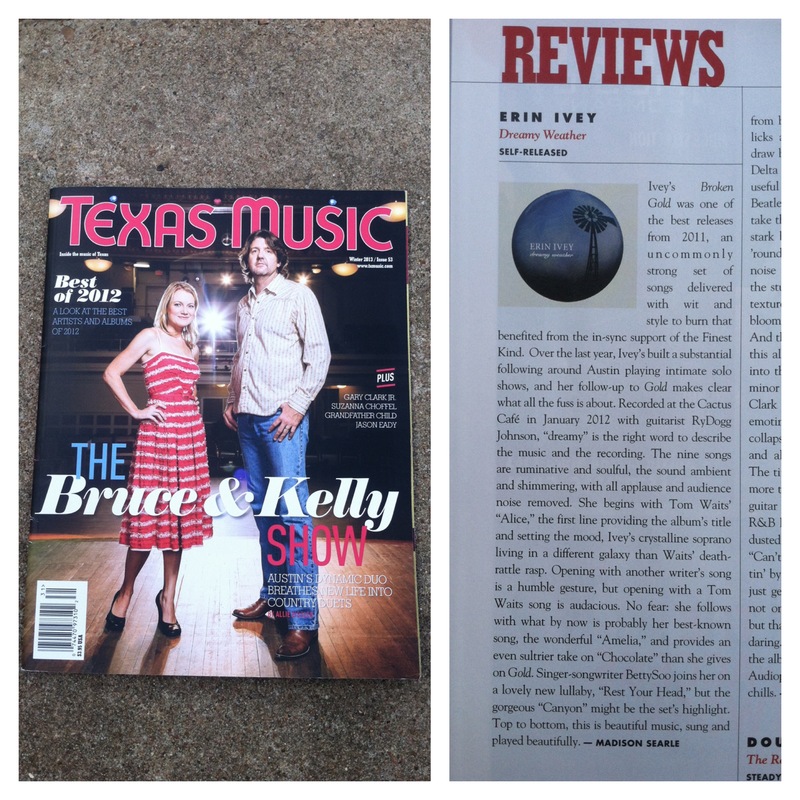 Austin, Texas-based folk songstress Erin Ivey has a loyal core group of fans. So much so, in fact, that a couple hundred of them donated 154 percent of the goal Ivey set out in a Kickstarter campaign to fund production of "Dreamy Weather." Those who gave their money (as well as those who didn't) are almost certain to fall in love with this nine-track collection of stripped-back, intimate tunes recorded during a performance at Austin's famed Cactus Cafe. With no overdubs, no errant pitches daubed out, and without usual backing band the Finest Kind, Erin Ivey's live debut, Dreamy Weather, shines as a bare-bones performance. Recorded at the Cactus Cafe in January, the local chanteuse invited guitarist RyDogg Johnson as her sole accompaniment, and together the duo stills even as it invigorates. Revisiting choice material from 2011 breakout Broken Gold as Ivey introduces new songs, even the familiar takes on a new outlook. The Gallic "Chocolate," chipped out of the original's dub overtones, becomes a seductive ballad as rich as its namesake, while freshly penned "Oh, Light" drifts in warm chords, light and airy despite its lyric forecast of inevitable endings, an idea furthered in stunner "Separational." Ivey's Broken Gold was one of the best releases from 2011, an uncommonly strong set of songs delivered with wit and style to burn that benefited from the in-sync support of the Finest Kind. Over the last year, Ivey's built a substatial following around Austin playing intimate solo shows, and her follow-up to Gold makes clear what all the fuss is about. Recorded at the Cactus Cafe in January 2012 with guitarist RyDog Johnson, "dreamy" is the right word to describe the music and the recording. The nine songs are ruminative and soulful, the sound ambient and shimmering, with all applause and audience noise removed. She begins with Tom Waits' "Alice," the first line providing the album's title and setting the mood, Ivey's crystalline soprano living in a different galaxy than Waits' death-rattle rasp.